Two Seamus Quigley goals gave Fermanagh a winning start in Division Three. The talented corner-forward struck twice in the space of seven minutes to help the Erne county to defeat Wexford by 3-07 to 2-05. Armagh proved too strong for Sligo, winning by 2-17 to 0-9 at the Athletic Grounds. Derry conceded two goals in the opening 10 minutes as they lost by 2-14 to 2-17 against Westmeath at Celtic Park. Enda Lynn's injury-time penalty was saved as Derry opened their league campaign with a surprise defeat. 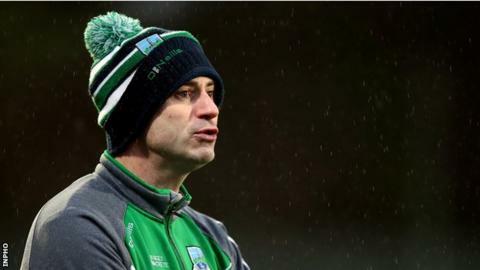 Fermanagh manager Rory Gallagher saw his side earn a comfortable win in his first league game in charge of his native county after an incident-packed encounter at Brewster Park that featured five goals, three red cards and a black card. Quigley's brace in the first half gave Fermanagh a 2-04 to 0-3 lead at the break - the forward was well placed to score from a rebound in the 28th minute and then rolled home his second goal after being set up by Conall Jones. The home side increased their lead at the start of the second half as Ryan Jones got his third point from play before towering Wexford midfielder Nick Doyle scored a goal to give the visitors some hope. Fermanagh responded with their third goal as Conall Jones blasted his shot into the net from 20 yards out. The match grew increasingly scrappy in the final quarter as Ryan Jones was shown a straight red card for an off the ball incident. Wexford used their numerical advantage to add another goal but the scorer, Tiernan Rossiter, was shown a second yellow card just minutes later and team-mate Brian Malone then earned a straight red. Fermanagh mentor Ryan McMenamin was then sent to the stands by the referee and Sean Quigley was also given a black card in the closing stages. "It's a nice start from our point of view that we won the game," said Gallagher. "We made life difficult for ourselves in that we were six or seven points up at half-time and then we had chances to stretch it to eight or nine at the start of the second-half. "We lost a man and we gave away a bad goal and all of a sudden it became a bigger battle than it ever should have been." Armagh demonstrated why they are considered favourites to achieve a place in Division Two as they cruised to a 14-point win over Sligo. Kieran McGeeney's side narrowly missed out promotion last season and they got their campaign off to an impressive start at the Athletic Grounds. The Orchard men got the opening seven points without reply and it took Sligo 27 minutes to get their first score. Freetaker Rory Grugan, midfielders Stephen Sheridan and Charlie Vernon and corner-forward Ethan Rafferty all got on the scoreboard in the early stages as Armagh led by 0-10 to 0-02 at half time. The home side surged further clear after the restart as Andrew Murnin palmed the ball into the net and Rafferty added a second goal as Armagh's league campaign got off to a winning start. Westmeath came away from Celtic Park with a morale-boosting win over Derry. Callum McCormack's goal in the opening minute put the visitors ahead and they never relinquished their lead against a Derry side without their Slaughtneil contingent. John Heslin converted an early penalty before Enda Lynn goaled for Derry in a frenetic opening 12 minutes at Celtic Park. James Kielt was influential for the Oak Leaf county as they fought back to trail by 1-07 to 2-07 at the break. Points from Ciaran McFaul and Danny Tallon helped Derry to get within a point of their guests in the 47th minute before Westmeath's Sam Duncan was shown a straight red card. However, 14-man Westmeath responded to restore their two-point advantage before Kielt was dismissed for a second yellow card to even the numbers on the field. Niall Toner's goal with four minutes remaining gave renewed hope to Derry but Lynn's stoppage-time penalty was saved as Westmeath held on for a surprise win. In the other game in Division Three, Longford beat their hosts Offaly by 3-18 to 1-13 at O'Connor Park.